We Love This List Of Offbeat Home Linen Brands And So Will You! We love that home linen is finally getting the recognition it deserves (or maybe we’re reaching that age where we enjoy crawling into soft cottons and fluffy pillows after a hard day’s work). From handwoven and handpainted blankets to block printed dhurries, we’ve got you covered (pun intended) ! Ensuring we have a little something for folks across all age groups, we’ve compiled a list of brands to shop for your needs. So in case you have a cuddle buddy over, impress them with your collection of cosy blankets! For those of you with kids who love Disney and other animated movies, Kathy’s Tales is a no brainer. Hand-painting your favourite characters on sheets and pillow covers, they also do table runners and towels as well. So if your kid is unwilling to take a shower or join you for dinner, a little bribe always comes in handy. Creating characters from the Looney Tunes and festive holiday themes are some of the designs that are readily available. If you’ve just moved to Koramangala and are planning to set up your house, head to Simply Stated for colourful table linen and monochromatic cushion covers. Their stuff is versatile and is of multi-use as well - the dhurries can be used as wall decor by simply hanging or framing them. If you’re a minimalist, their dishware is bound to appeal to you since the designs and patterns can create beautiful aesthetics for your romantic dinner plans. Head to Alaam Perfect Homes for budget-friendly home linen. They like to create twists in their products with the combination of metal free dyes, sustainable fabric and funky designs and prints. If you like to enjoy your individuality, keep an eye out for their double sheets that feature different patterns split down the middle. Ranging from INR 80 to INR 550, their products are quite affordable and innovative at the same time. Being an extension of an interior design practice, the studio has linens that are great for all seasons. For those of you who don’t have the patience to do up your house, the good peeps at Purple Rose Studio will go the extra mile for you. After understanding your taste, they’ll suggest the perfect patterns for you. 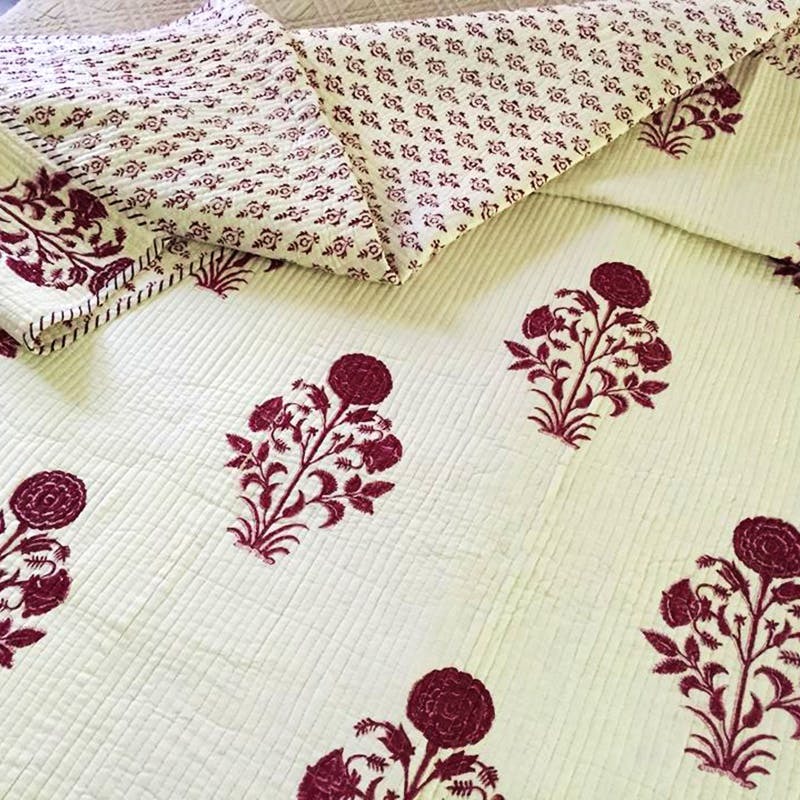 Expect bright Jaipuri block prints in floral and Indian motifs; their products also make for great gifts as they are sure to go with any kind of furniture. Not only does Puja Malik sell adorable looking linens for your babies, she’s also made them baby safe. Indulging only in pure cotton for her products, she makes bedspreads, dohars, quilts and cushions. From adorable penguin cushions to season themed blankets, Puja has a variety of cartoon characters to choose from as well! So if you were worried about crying babies, we suggest buying from Sheer Joy to shush your little one to bed at the affordable range of INR 550 to INR 1800.